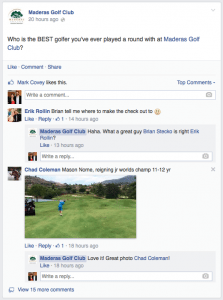 Social Media Check-Up for Golf Courses: Are You Doing It Right? Most golf course owners and operators know they need to be using the internet to attract new golfers. Most golf course owners and operators know they need to be using social media tools like Facebook, Twitter, and Instagram to increase rounds. And yet, most golf course owners and operators are uncertain about how to navigate the online marketplace to reach more golfers, convince them to play more often and spend more money at their golf course. 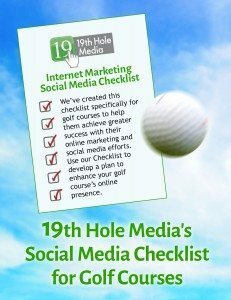 To help golf course owners and operators, 19th Hole Media has created a Social Media Check-Up for Golf Courses. This check-up should help you understand your online presence and whether or not it can be improved. Although, this Check-Up is only half the equation. We will be giving our Social Media Checklist to subscribers on our email list for free. 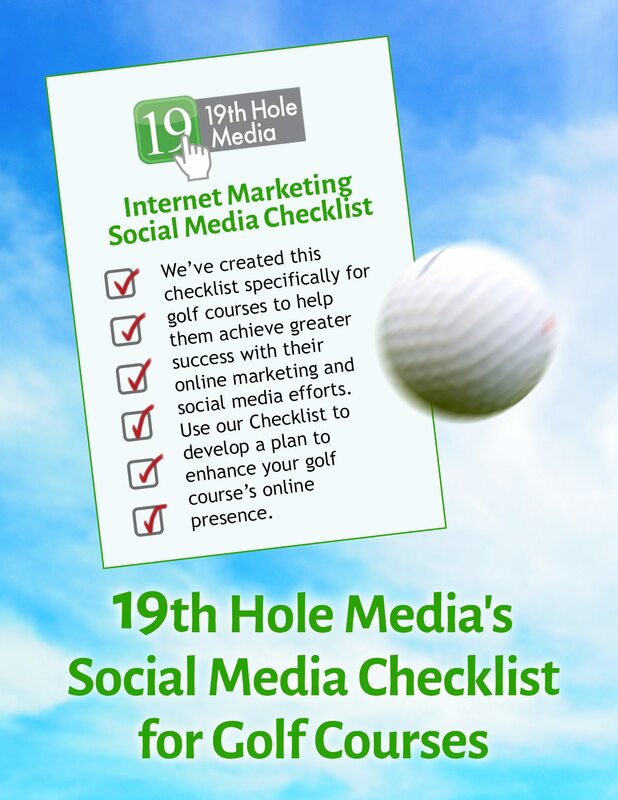 19th Hole Media’s Social Media Checklist for Golf Courses– coming soon. Check out this post to see where your golf course stands. You’ll be well prepared when we send you our Social Media Checklist, a well-organized resource that will help you move forward and develop a plan to step up your social media efforts to the next level. It will be available only to those on our email list. If you know someone that might benefit from our Check list, make sure they join our email list! Sign up for our email newsletter. You will receive more helpful information like this, and our Social Media Checklist, a well-organized resource that will help you move forward and develop a plan to step up your social media efforts. If you need assistance contact Zeb at (909) 973 – 9089 or Zeb@WelbornMedia.com. A golf course’s website should be the online marketing home. You’d be surprised how many golf courses are still without a website, one of my colleagues informed me that he has a list of over 3,000 golf courses that are still without a website . . . so, if your golf course has a website, you’re actually ahead of the curve. Poor: No website or a website that has limited information, no functionality or is one page with no external links. Average: Many golf courses are also controlled by management companies. In some cases their online presence is controlled by these larger management companies which is not ideal for a local golf course. The way the internet and online marketing is shifting, it is giving more and more attention to local organizations rather than a large corporate presence. In addition, every golf course is unique and that should be reflected on the website. Exceptional: The best websites are those that demonstrate the unique character of a golf course, are updated regularly with events/outings/promotions and other course news. These websites also highlight in detail the different activities/events that go on at your course, giving golfers an opportunity to book tee times, contact tournament/banquet coordinators and offer an array of images that depict the ideal experience a patron will have at your golf course. It should also be easy to navigate and look modern. Some websites to use as an example are: Maderas Golf Club, Stevinson Ranch Golf Club and Arroyo Trabuco Golf Club. They demonstrate the unique character of the golf course, are easy to navigate and are updated regularly. Every golf course should have an email marketing campaign in place. In my experience, the email list has been the most effective way to encourage golfers to make purchasing decisions. When done right an email campaign can have a significant impact on the bottom line. When done wrong, it can turn golfers away. Poor: Not having an email list is setting up a golf course for failure. If you’re not collecting emails and using those emails to sell your products and services, your competitors will syphon off your golfers through their special offers and discounts. Once you lose a customer, it will become much more difficult to attract more golfers to your course . . . especially without an email list. Golf courses should think of their email list like an insurance policy that you can call on when times are slow to get new golfers to experience your golf course. Offer exceptional service while they are there and that will increase the number of rounds golfers play at your course. Average: Most golf courses I’ve encountered are missing two major components to creating an effective email marketing campaign. The first is that they do not have a proactive strategy to get new golfers to sign up for their email list. The second thing most golf courses are missing in their email marketing campaigns is creativity. As individuals, our email inboxes are bombarded with sales messages from all different types of businesses. In order for golfers to open your email they have to have compelling headlines and compelling copy. Emails with generic headlines like, “It’s a Beautiful Day, Come on Out!,” “Special Discount on Golf this Week Only,” or “Check Out this Sunday Golf Special” will get lost in the shuffle because they are not creative, not specific and are obviously sales driven. Most of us delete them immediately. Every email you collect can lead to increases in sales. Getting creative in the ways you get golfers to sign up for your email newsletter is a must. Creating compelling headlines and compelling copy will increase the chances your emails are actually read. One golf course that does email marketing really well is the Champions at the Retreat who have emails with headlines like, “The easiest Father’s Day gift is a few clicks away,” “FREE greens fees at Champions Club (not a joke! ),” and “THREE entries for the price of one!” The percentage of people who will open these emails is much higher than those mentioned in the average section. If more golfers are compelled to open your emails, then the more golfers will be compelled to take advantage of the call to actions you have in your emails. Poor: Golf courses with a poor Facebook presence are those that do not have one at all, and those who set one up but haven’t updated it in months. Average: Currently, an average Facebook presence for golf courses is a golf course that updates their Facebook page regularly but has no plans for outreach. Their posts are strictly sales driven, too similar to one another, lack engagement and often are not relevant to the golf course itself. Exceptional: The best golf courses on Facebook are those that promote the unique character of the golf course, build an engaged community and vary the type of posts they use. These golf courses post pictures, have a creative outreach program to attract new followers, utilize the highly targeted Facebook advertising feature, use copy designed to engage their golfers, follow up with discussions, vary the type of posts, and thank their followers regularly. For examples of golf courses that have an excellent Facebook page, please visit the Arroyo Trabuco, Maderas Golf Club and/or Stevinson Ranch Golf Club Facebook pages. A blog is a great way to post relevant content on your website to share with golfers at your golf course. Poor: A non-existent blog page that delivers no new content to your golfers or followers. Average: An average golf course blog is one that posts infrequently and doesn’t offer anything of value to your followers. Exceptional: An exceptional blog highlights all major activities that take place at your golf course. The blog focuses on your core golfers, golf-related groups, and highlights other areas where your golf course can see an increase in revenues, like banquets, weddings, the golf shop or restaurant. Poor: Most golf courses do not use Twitter. Average: Many of the golf courses that do use a Twitter account only tweet out sales messages. They do not monitor mentions of their course and they make no effort to connect with their golfers on Twitter. Exceptional: Golf courses that understand how to use Twitter and make the most of it are courses that engage Twitter users who mention their golf course in meaningful discussions. They reach out to golfers who indicate they play golf in the geographic region of the golf course. And they promote the game of golf through their followers. 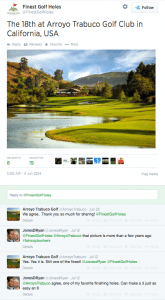 To see an example of a golf course that does a good job on their Twitter presence, check out the Arroyo Trabuco Twitter Account. YouTube is a fantastic visual resource that golf courses should use to remind every golfer how nice it is to be outdoors at the golf course. Poor: Most golf courses do not use YouTube. Average: Many golf courses that have set up a YouTube account have a page that contains a scattering of videos with very poor quality that don’t seem to be set up with any clear purpose or goal. Exeptional: The golf courses that use YouTube well post videos with high-quality audio and video. Each video has a clear call to action or a specific purpose for the video. Excellent videos to include are golf tips to help your golfers, demonstrations of appropriate golf etiquette, testimonials from golfers and commercials promoting your golf course. Instagram is a great platform for reaching out to younger golfers because it’s easily accessed and utilized from any mobile smart phone. Average: Golf courses that use Instagram inconsistently and share boring or poor quality images. Exceptional: An Instagram account should be posted to daily with unique pictures. 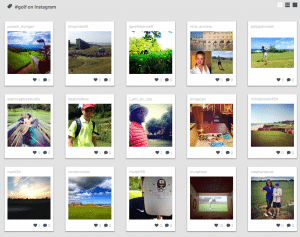 If any golfers appear in the photo their Instagram accounts should be tagged. And the copy of every post should include appropriate hashtags and be designed to get users to engage. Review sites are extremely important for any business. Nowadays there is a lot that a business can do to affect the status of their golf course on the web. Despite this, most golf courses owners and operators visit review sites infrequently and many do not monitor mentions of their golf course at all. Poor: Never find out what is being said about your golf course online. Average: The other mistake often made is golf course owners or operators will respond too emotionally or without empathy to negative reviews. This can easily escalate the situation or demonstrate that you’re not interested in the plight of your customers. Exceptional: An owner or operator that manages their online reputation well is someone who monitors what is said about the golf course and responds to comments, questions or concerns regularly and in a professional manner. They empathize with the customer and respond to situations uniquely. Being proactive in managing your online reputation will help avoid major issues, can convince golfers to return and encourage more golfers to visit your golf course. These reviews can also indicate trouble areas or areas of strength for your business which can help you build a better business. The previously mentioned platforms are essential for any golf course competing in today’s market to attract new golfers to their golf course. However; an exceptional social media presence requires devoting some of your resources to social media sites which can be of importance for golf courses currently and in the years to come. Pinterest is excellent to share compelling photos of the golf course, banquet facilities and golfers. An exceptional Pinterest account uses high-quality photos that link to your website and have a lengthy, keyword-rich description for each photo. Vine is a platform that records brief 6-second videos. You can use these to attract a younger generation of golfers. Encourage your young golfers to create unique and compelling videos at your golf course and you can have a hit marketing tactic on your hands. Google+ – Unlike Facebook and Twitter, all Google+ updates are indexed by the Google Search Engine. When people are searching for golf-related activities, the more content you have on Google+ and the more connections you have, the more likely your posts will show up in a Google Search. For example, if a golfer who is connected to you on Google+ searches for “California Golf” on Google, something you’ve posted in the past with the words California and Golf may show up at the top of that person’s Google search. LinkedIn – LinkedIn is for professional contacts. As an Owner, General Manager, Marketing Director or Tournament Director, it’s important to connect with tournament organizers, banquet organizers or influential golfers from your personal account to establish a deeper connection designed to gain more golfers, retain tournaments and share insider information about your golf course to your LinkedIn connections. Creating a strong social media presence can seem overwhelming, especially if you’re starting from scratch, but slowly improving your internet marketing and social media habits can have a drastic impact on your bottom line. If you found our Social Media Check-Up for Golf Courses helpful, please subscribe to the 19th Hole Media Newsletter to get more advice and help on developing your social media presence. To help you, we’ve created a Golf Course Internet Marketing and Social Media Checklist to help you enhance your golf course marketing efforts and take your golf course to the next level. 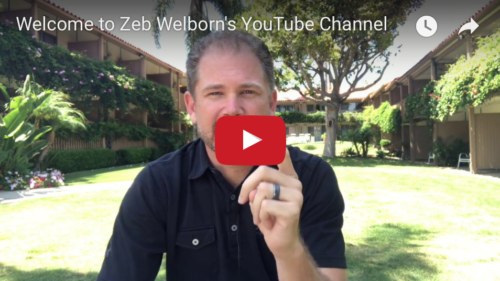 Contact Zeb at (909) 973 – 9089 or Zeb@WelbornMedia.com if you’d like to get your free social media checklist to see if your online presence is poor, average or exceptional! Sign up and receive our Social Media Checklist! How Do We Get More Younger Golfers Playing Golf? One of the biggest reasons why the golf industry has been struggling in current years is because we’ve become complacent and lacked innovation. Our times have changed over the past couple of decades and the golf industry, as a whole, has been slow to adapt. Junior golfers are an important component toward growing the game. As older golfers leave the sport, we need to be inspiring more younger golfers to take up the game to fill in the gaps. In order to do this we need to communicate with a younger generation . . . the way they prefer to communicate. Traditional media like magazines, newspapers and television ads are not viable options in todays internet and social media age. Young people are using platforms like Facebook, Twitter, Instagram, Vine, YouTube videos and a variety of other to connect and communicate with one another. They are also using those mediums to connect with their passions. We are not giving young golfers the opportunity to connect with local golf courses and people in the golf community because, for the most part, local golf courses are not socially active online. We’re missing out on the biggest opportunity of our time and are giving it up to other recreational sports and activities that are seizing this opportunity. If we are to grow golf, we need to connect with younger golfers and speak their language using social media. At 19th Hole Media, we’re helping to get the word out about social media and the impact it can have on the future of the golf course industry. Please contact us to learn more about how we can get younger golfers playing at your golf course . . . Or, just to connect with us!